Evidence regarding whether or not antibiotic prophylaxis is beneficial in preventing post-operative surgical site infection in adult inguinal hernia repair is conflicting. A recent Cochrane review based on 17 randomised trials did not reach a conclusion on this subject. This study aimed to describe the current practice and determine whether clinical equipoise is prevalent. Surgeons in training were recruited to administer the Survey of Hernia Antibiotic Prophylaxis usE survey to consultant-level general surgeons in London and the south-east of England on their practices and beliefs regarding antibiotic prophylaxis in adult elective inguinal hernia repair. Local prophylaxis guidelines for the participating hospital sites were also determined. The study was conducted at 34 different sites and received completed surveys from 229 out of a possible 245 surgeons, a 93 % response rate. Overall, a large majority of hospital guidelines (22/28) and surgeons’ personal beliefs (192/229, 84 %) supported the use of single-dose pre-operative intravenous antibiotic prophylaxis in inguinal hernia repair, although there was considerable variation in the regimens in use. The most widely used regimen was intravenous co-amoxiclav (1.2 g). Less than half of surgeons were adherent to their own hospital antibiotic guidelines for this procedure, although many incorrectly believed that they were following these. In the south-east of England, there is a strong majority of surgical opinion in favour of the use of antibiotic prophylaxis in this procedure. It is therefore likely to be extremely difficult to conduct further randomised studies in the UK to support or refute the effectiveness of prophylaxis in this commonly performed procedure. A comment to this article is available at http://dx.doi.org/10.1007/s10029-013-1141-4. Hernia repair is one of the most commonly performed general surgical procedures worldwide with an estimated 20 million operations performed annually . Inguinal hernia repair, either with or without an implanted mesh, is one of the most frequently performed operations in the UK: approximately 71,000 primary and recurrent inguinal hernia repairs were performed in England in 2010–2011 . Surgical site infection is an important potential complication of any surgical procedure. In most forms of surgery, antibiotic prophylaxis is known to reduce the risk of post-operative wound infection. The relative reduction in risk appears to be consistently around 60 % across many different forms of surgery, ranging from clean to heavily contaminated procedures . The ideal timing for optimal serum drug levels is 30–60 min before surgical incision , and post-operative administration of antibiotics is now generally considered to be of no benefit in routine practice . However, there is no clear consensus on whether or not antibiotic prophylaxis is effective in elective inguinal hernia repair. Reviewers at the Cochrane Collaboration concluded in 2012 that evidence derived from 17 randomised controlled trials (RCT) regarding the use of antibiotic prophylaxis in inguinal hernia repair both with and without mesh was inconclusive, neither allowing them to encourage nor discourage its use . A separate meta-analysis, also published in 2012, focussed purely on inguinal hernia repair with mesh and included six of the 11 RCTs identified by the Cochrane review. This analysis concluded that there was a significant benefit associated with prophylaxis . One further RCT has recently been reported: this small study found no significant difference in risk of infection between use of prophylaxis and placebo . Drawing from such conflicting evidence, there is understandable inconsistency between clinical guidelines: in England and Wales, the National Institute of Clinical Excellence (NICE) recommend the use of antibiotic prophylaxis in clean surgery with implanted material  but guidelines issued by the Scottish Intercollegiate Guideline Network (SIGN) state that antibiotic prophylaxis is not needed in inguinal hernia repair with or without implanted mesh . The European Hernia Guidelines advise that there is no indication for routine use of antibiotic prophylaxis in elective open or laparoscopic groin hernia repair in low-risk patients but that prophylaxis should be considered for patients with risk factors for wound infection . 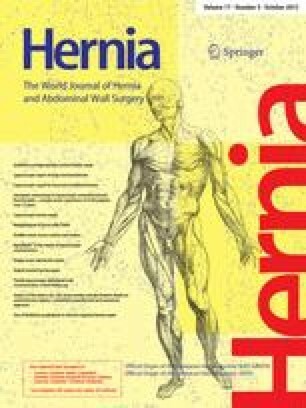 In order to examine the feasibility of a future RCT, this study aimed to determine policies, practices and beliefs around the usage of antibiotic prophylaxis in elective inguinal hernia repair with a mesh in adults and to ascertain whether clinical equipoise exists regarding the effectiveness of this treatment. The objective was to survey surgeons who routinely perform this procedure in the National Health Service (NHS) in London and south-east England. We hypothesised that substantial variation might exist between hospital policies and individual surgeons’ practices and that surgeons hold diverse opinions on the efficacy of antibiotic prophylaxis. This study was developed and delivered by the London Surgical Research Group (LSRG), a surgical trainee research collaborative. The administrative area covered by the London Deanery (a regional body overseeing the training of doctors) was used as the reference frame. This area encompasses all NHS Trusts in London and south-east England. Trusts and sites that did not perform elective inguinal hernia repair in adults (e.g. mental health trusts) were excluded, and we identified the eligible hospitals within each of the relevant Trusts. Where the same surgeons operated in more than one hospital within a Trust, these were considered as a single site for the purposes of this survey. We aimed to achieve the highest possible coverage of all consultant and associate specialist (consultant-level) general surgeons currently performing elective inguinal hernia repairs within the reference frame. Training-grade surgeons were recruited as local investigators for the Survey of Hernia Antibiotic Prophylaxis usE (SHAPE) study in as many of the eligible hospitals as possible. The principle institution(s) affiliated with a medical school were categorised as Teaching Hospitals, all other institutions were categorised as District General Hospitals (DGH). All investigators underwent training on the aims and methods of survey collection. Before surveying commenced, investigators submitted details regarding their own hospital, including the number of eligible consultant/associate specialist surgeons and the local policy (if any) regarding use of antibiotic prophylaxis in hernia surgery. Eligible surgeons were identified by local investigators at each Trust as they were best placed to determine which surgeons were actively performing hernia repairs. Each investigator administered the survey to surgeons in their hospital only and entered these results into an online database. Surgeons of lower levels of seniority, such as specialist registrars and staff-grade surgeons, were excluded from the survey as they were considered not to be fully autonomous in their decision making regarding the use of prophylaxis. Thus, only consultant-level surgeons who reported that they had performed elective inguinal hernia repair (either open or laparoscopic) in adults in the last 12 months in a NHS hospital were included. Surgeons completing the survey described the agents, route, timings and duration of antibiotic prophylaxis they used in elective primary open and laparoscopic inguinal hernia repair with a mesh in an idealised 70-kg adult patient with no known allergies or additional risk factors. Surgeons also reported their beliefs regarding the effectiveness of antibiotic prophylaxis in relation to placebo by scoring the likelihood of five statements (e.g. “Placebo is substantially better than prophylaxis”) on a 10-point scale (1 = very unlikely, 10 = highly likely)—this approach has previously been used to quantify the beliefs of doctors regarding the effectiveness of a treatment . The full survey used in the SHAPE study is available as “Appendix 1”. Wherever a surgeon did not express a clear preference (e.g. “I use either A or B”), this was evaluated as an even split of preference, such that the sum of an individual’s responses came to one (e.g. A = 0.5, B = 0.5). Data obtained by this approach were validated by separately emailing 5 % of surgeons (selected at random from all respondents) asking them to countercheck their responses—this approach also permitted comparison of response rates. All data were anonymised prior to analysis. Statistical tests were performed using STATA version 12 (StataCorp, College Station, Texas, USA). This paper was prepared according to the STROBE guidelines for reporting of observational studies . There were 65 eligible hospital sites identified in 44 NHS Trusts within the London Deanery area. Investigators were successfully recruited from 35 of these hospital sites, but one investigator subsequently withdrew without contributing results so that data were received from 34 sites (four Teaching Hospitals and 30 DGHs), representing 52 % of all eligible sites. There was no association between type of hospital (Teaching Hospital vs. DGH) and inclusion in the study (Fisher’s exact test p = 0.50). In these 34 hospitals, a total of 245 eligible surgeons (median 7, range 1–13) were identified. Surveying was carried out between 1 June and 25 July 2012. A total of 229 completed surveys were returned, giving an overall response rate of 93 %. Almost all sites (31/34) achieved a response rate of 80 % or more (range 25–100 %). Reasons for non-participation included surgeons declining to complete the survey or the surgeon being unavailable throughout the study period. The process of identifying sites and surgeons is shown in Fig. 1. Amongst the 229 respondents, there were 206 consultants and 23 associate specialists with a median of 9-year experience (range 0–40 years) since receiving their Certificate of Completion of Training (CCT) or equivalent. Of these, 223 (97 %) reported that they performed open repair, 143 (63 %) reported that they performed laparoscopic repair and 137 (60 %) reported that they performed both. Of surgeons who completed the survey, 13 were randomly selected to also be contacted by email. Of these, seven responded and all respondents confirmed that their survey responses had been reported correctly. Out of the 34 hospital sites surveyed, 28 had guidelines in place applicable to antibiotic prophylaxis in inguinal hernia repair. Out of these guidelines, 22/28 recommended some form of single-dose intravenous antibiotic prophylaxis to be used in inguinal hernia repair with an implanted mesh. Conversely, 5/28 of these guidelines recommended that prophylaxis should not be used. One hospital guideline left the decision about whether or not to use antibiotics for this procedure to the surgeon. All guidelines advising the use of antibiotic prophylaxis recommended single-dose intravenous agents, but there was considerable variation in the preferred drug(s) (Table 1). The most commonly recommended antibiotics were co-amoxiclav 1.2 g (7 guidelines), cefuroxime 1.5 g (6), and cefuroxime 1.5 g and metronidazole 500 mg (4). For open inguinal hernia repair with a mesh, 193/223 (87 %) surgeons reported that they would use antibiotic prophylaxis; 28/223 (13 %) surgeons stated that they would not use any antibiotic prophylaxis. For laparoscopic repairs, the use of antibiotic prophylaxis was slightly less common: 113/143 (80 %) surgeons reported that they would use some form of prophylaxis, but this difference was not statistically significant (χ 2 = 3.40, p = 0.065). There was no evidence that whether or not antibiotic prophylaxis was used was associated with level of experience, in terms of years since CCT (open repairs; 2-tailed t test = 0.63, p = 0.530). Most surgeons who performed both open and laparoscopic surgery stated they would use the same prophylaxis for both procedures (130/137, 95 %). All surgeons who made use of antibiotic prophylaxis reported that they would use single-dose intravenous antibiotics given shortly prior to incision (Table 2). In open hernia repairs, the most commonly described regimen was co-amoxiclav 1.2 g, accounting for 118/223 (53 %) of surgeons’ preferences, with a further 11 (5 %) of surgeons reporting the use of an alternative co-amoxiclav-based regimen. Regimens based around the use of cefuroxime (n = 43, 19 %), gentamicin and metronidazole (n = 10, 4 %), and flucloxacillin (n = 5.5, 2 %) accounted for much of the remainder. The distribution of regimens suggested for use in laparoscopic surgery was similar to that in open surgery. A small number of surgeons described use of unusual intravenous regimens involving agents that are normally reserved for specialist purposes, such as ertapenem, tazocin or clindamycin (n = 5.5, 2 %). A very small number of surgeons reported they would use topical gentamicin applied to the implanted mesh (n = 3, 1 %), though this was always in addition to an intravenous agent. In the 27 hospitals where the local guidelines made a specific recommendation about the use of antibiotic prophylaxis in open inguinal hernia repair, only 86/186 (46 %) surgeons reported a practice that was adherent to their own local guidelines. This level of adherence varied considerably between hospitals, ranging from none of the surgeons (in seven hospitals) to all surgeons (in three hospitals). When surgeons were asked to give the reason for their reported use of antibiotic prophylaxis, 104 surgeons stated that they were following local guidelines. However, of these, only 56 (54 %) described a practice that actually adhered to the relevant hospital policy. There was no evidence that adherence to guidelines was influenced by level of experience (years since CCT; t test statistic = 0.176, p = 0.860), professional grade (consultant vs. associate specialist, χ 2 = 0.146, p = 0.703) or type of institution (Teaching Hospital vs. DGH, Fisher’s exact test; p = 0.110). All 229 surgeons quantified their beliefs regarding the effectiveness of antibiotic prophylaxis by scoring the likelihood of five separate statements. Figure 2a shows the mean likelihood score (between 1 and 10) assigned for each statement; Fig. 2b shows a count for each statement of how many surgeons believed that this statement was the most likely to be true. Of the statements, 129/229 (56 %) surgeons rated the statement “Prophylaxis is substantially better than placebo” most favourably and a further 63 (28 %) rated “Prophylaxis is slightly better than placebo” as their most-favoured statement. Beliefs and practices were largely congruent—for 200/229 (87 %) surgeons, their stated practice conformed to their most strongly held belief. In this large survey of hospital guidelines and surgeons’ practices and beliefs, we surveyed approximately half of all trusts and surgeons currently performing inguinal hernia repairs in the south-east of England. Where hospitals had guidelines in place, the majority of these (22/28) recommended that antibiotic prophylaxis should be used in inguinal hernia repair; only a minority (5/28) recommended that prophylaxis was not needed. All guidelines advocating the use of prophylaxis recommended regimens comprising single-dose intravenous injections given immediately before first incision. A large majority of surgeons (87 %) reported they would use some form of single-dose intravenous pre-operative antibiotic prophylaxis for elective open inguinal hernia repair with a mesh in an idealised patient without allergies or risk factors. A similar proportion (84 %) believed that prophylaxis was either slightly or substantially better than a placebo (Fig. 2b). A dose of 1.2 g of co-amoxiclav was the most popular antibiotic choice for both hospital guidelines and surgeons’ usage, but use of a wide variety of other drugs was described. The use of non-standard regimens, such as topical gentamicin applied to the hernia mesh or intravenous carbapenems, was also reported, albeit rarely. The use of topical prophylaxis has recently been reviewed  and, although this practice may be beneficial in some other forms of surgery, it does not appear to have a role in routine inguinal hernia repair. The effectiveness of hospital guidelines in influencing the practice of surgeons regarding the choice of antibiotic seemed poor: less than half of surgeons were adherent to their hospital prophylaxis guideline, and furthermore 46 % of surgeons incorrectly believed that their own practice was in accordance with their local guidelines. By contrast, personal beliefs appeared a stronger determinant of practice—87 % of surgeons had a practice that reflected their own beliefs about the effectiveness of prophylaxis. Surveys of guidelines and practices in this area are important as the evidence base is currently inconclusive. According to reviewers at the Cochrane Collaboration in 2012, there is no clear indication whether or not antibiotic prophylaxis is beneficial. In Spain in 1996, a survey found that antibiotic prophylaxis was recommended in inguinal hernia repair in 50/72 (69 %) hospitals but the authors noted that they could not determine whether the actual practices of surgeons followed these guidelines . In Brazil in 1995–1996, a survey in a single teaching hospital where the hospital policy stated that no prophylaxis should be used for inguinal hernia repair found that antibiotics were given in 20/43 of these operations, often in multiple doses . We are not aware of any previous studies that have examined this subject in the UK. To our knowledge, this is the largest-ever survey that has simultaneously assessed hospital guidelines and the practices and beliefs of surgeons regarding the use of antibiotic prophylaxis in elective inguinal hernia repair in adults. This survey was undertaken within a clearly defined reference frame in the UK, with a total of 34 participating sites and with no indication of differential participation between DGHs and Teaching Hospitals. This study used an innovative trainee-led approach to collecting these data. The use of multiple online tools for investigator training, survey collection and data analysis facilitated the rapid and low-cost delivery of the study. We have shown that a trainee research collaborative can achieve a response rate beyond that attainable with traditional approaches to surveying. As this study had a 93 % response rate from participating sites, there is unlikely to be significant bias arising from differential non-participation of surgeons. For comparison, two high-profile surveys of surgeons in the UK achieved response rates of 71 % (60/85 plastic surgeons)  and 76 % (376/498 breast surgeons) . We found that when consultant general surgeons were directly contacted by email, a relatively poor response rate (54 %) was obtained—though all respondents indicated that their survey responses had been correctly reported by the local investigator. A limitation of this study is that it was confined to surgeons in the south-east of England. There is no reason to believe that the results of this survey cannot be generalised within the UK, but as the use of antibiotics shows considerable variation between countries, these results may not necessarily reflect practices and opinions elsewhere. It is also possible that this survey collection method is subject to interviewer bias or poor reliability but we believe this risk is minimal as we used a standardised written questionnaire and trained investigators appropriately prior to data collection. The results of this survey suggest that research into the benefit of prophylaxis in inguinal hernia repair has reached an impasse. The evidence base for antibiotic prophylaxis in this procedure is inconclusive and further RCTs are needed. However, clinical equipoise is an essential prerequisite for any such study. Ethicists have found that when professional belief of treatment effectiveness is beyond an 80:20 ratio (i.e. 80 % of professionals hold one belief, 20 % the converse), less than 3 % of the lay public would consider a RCT of that treatment morally justifiable . In this survey, 84 % of surgeons in London and south-east England believed prophylaxis to be more effective than placebo. It is therefore hard to conceive of a further RCT on this question being undertaken in this area or any other location where surgeons hold similar opinions. In the absence of conclusive evidence, practice will continue to be largely determined by professional opinion. The authors thank all participating surgeons and hospital trusts. No direct funding was received for conduct of this study. A.A. is supported by a Research Training Fellowship (Grant Number 085042) from the Wellcome Trust of Great Britain, which has provided funds for open access publication of this report. C.H.K is supported by the Higher Education Funding Council for England (HEFCE). Open AccessThis article is distributed under the terms of the Creative Commons Attribution Noncommercial License which permits any noncommercial use, distribution, and reproduction in any medium, provided the original author(s) and the source are credited.